Update! Very beta and barely tested re-write, should work in Windows 8.1 and 10: Zoom Lens 2015 Beta. Important note: If you are using Windows 7 (and/or Vista), you will need to use a "basic" desktop theme. The prettier graphics options that Windows 7 uses otherwise causes Zoom Lens to not function. "Slow Updates if Mouse Hasn't Moved" - By default, the magnifier is constantly refreshing itself. This option will cause it to refresh less frequently if you aren't doing anything with your mouse, which may cause an improvement in operation. 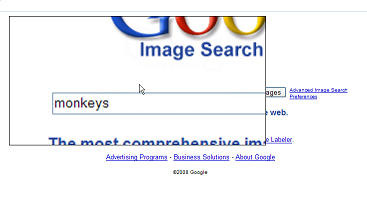 "Take out or put away when mouse is in upper left corner" - When checked, the magnifier will magically go away or come back whenever you drop your mouse in the extreme upper left corner of the screen. 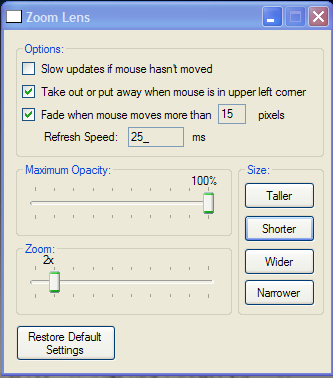 "Fade when mouse moves more than ___ pixels" - When checked, the magnifier will fade out a bit whenever you move the mouse more than a certain distance. 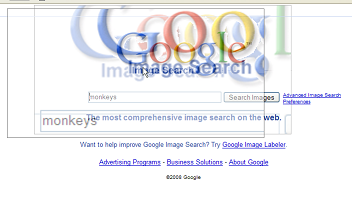 This allows you to see parts of the desktop that may be obstructed by the lens itself so that you can move to them. "Refresh Speed" - This specifies the delay in how quickly the magnifier redraws itself, in milliseconds. A larger number will refresh less smoothly, but may improve performance. "Size" - The "Taller", "Shorter", "Wider" and "Narrower" buttons adjust the shape of the magnifier. "Maximum Opacity" - If you want to be able to see through the magnifier a little bit at all times, adjust this slider. "Zoom" - This controls the amount of magnification being performed. "2x" for instance is twice as large as normal. "Restore Default Settings" - The magnifier automatically saves your settings when you close it. This button allows you to return it to its original state. Windows XP or better. You will likely need the .NET runtime if you don't already have it. Under Windows 7 (and likely vista) you will need to choose a "basic" desktop theme - the fancy new desktop graphics conflict.